The Back-from-Thanksgiving-Break version of MRM’s Daily Bite includes news from Caterwings, MarketMan and Upserve, Mrs. Winner’s Chicken & Biscuits, Fishbowl and Les Amis d’Escoffier Society of New York. Online catering marketplace Caterwings released the 2017 Best Food Destinations Index, detailing the top 100 best food cities around the world. With food tourism as one of the fastest growing travel trends, cities all over the world are now vying for the accolade of best food destination, so Caterwings decided to undertake this study to reveal the ultimate top 100 best food cities. The research began by analysing thousands of cities based on the number of restaurants per capita, as well as established international restaurant rankings to determine the final list of top 100 cities. They then considered which factors are most important to food lovers, opting for four scalable criteria; the opinion of critics, the accessibility and variety of food on offer, the quality of available food, and the affordability of dining in a restaurant. Within these categories the study included factors such as percentage of fast food restaurants as compared to restaurants, availability of vegetarian/vegan options and number of restaurants per 10,000 citizens. Due to preferences in taste, they also analysed the quality of both the high-end restaurants and the street food scene in each city. In order to calculate the accessibility and affordability of food in each location, Caterwings calculated how many hours a person on minimum wage would have to work in order to afford a two-person dinner in a restaurant. To round off the study and find out an on-the-ground expert view, they then asked 20,000 food journalists and restaurant critics to rate the quality of both the food scene and the food service in their city. All of these factors were then given a score to determine the final ranking of 2017’s Best Food Destinations, with every city on the final list worthy of recognition and praise. When asked to rate which cities had the best quality of the culinary scene, experts ranked San Sebastian, Spain first, followed by fellow Spanish city Barcelona and Peruvian city Lima. When asked to rate which cities had the best quality of food service, experts ranked San Sebastian, Spain first, followed jointly by Oslo, Norway, London, UK and Zurich, Switzerland. Seoul, South Korea has the most restaurants per 10,000 citizens at 110.23, followed by Osaka, Japan and Jeonju, South Korea. Jeonju, South Korea has the lowest percentage of fast food outlets as compared to restaurants at 0.06 percent, followed by fellow South Korean city Seoul and Japanese city Osaka. Dubai, UAE ranks first for diversity of cuisine, followed by Mumbai, India and Seoul, South Korea. Zanzibar, Tanzania comes out on top for vegetarian/vegan options, followed by Venice, Italy and Edinburgh, UK. San Sebastian, Spain ranks first for high end restaurants, followed by Tokyo, Japan and Paris, France. San Fernando – Pampanga, Philippines comes out on top for street food, followed by American cities Honolulu and Austin. The food in New York City, USA is the most affordable for locals, followed by Singapore, Singapore and Dubai, UAE. The food in Hanoi, Vietnam is the most affordable for visitors, followed by Kiev, Ukraine and Chiang Mai, Thailand. Citizens earning minimum wage must work the most hours in Pondicherry, India, to afford a dinner in a restaurant for two, followed by Dakar, Senegal and Chennai, India. MarketMan, the cloud-based inventory management and purchasing solution will integrate with the Upserve Marketplace, a single hub for unifying the widest array of technology solutions for restaurateurs. Upserve’s launched Upserve Marketplace so that restaurant owners and operators have a one-stop-shop for every aspect of running their business, connecting more than a dozen apps – spanning categories like accounting, inventory management, gift cards, data security and more – directly with the Upserve platform. Mrs. Winner’s Chicken & Biscuits is re-establishing its brand footprint in Atlanta with the help of restaurant veteran Gyrone Hilliard. Located at 4350 Fulton Industrial Blvd SW next to the Waffle House, Hilliard’s new location marks the third Mrs. Winner’s restaurant in the greater Atlanta area. 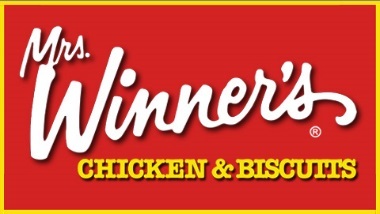 Mrs. Winner’s was founded in 1979 by former KFC owner, Jack Massey. Massey helped build Mrs. Winner’s into an iconic southern fried chicken brand with 184 restaurants at its peak. Under new ownership since 2013, Mrs. Winner’s has been adapted to meet the needs the 21st Century consumer. With updated technology, elevated customer service and new items being added to the menu, Mrs. Winner’s continues to serve the same authentic southern food with a modern flare. “I consistently hear from customers wanting Mrs. Winner’s back in their communities, so we’re excited to open another Atlanta-area restaurant to provide this great community with delicious, authentic southern food,” said John Buttolph, CEO of Mrs. Winner’s. Currently, Mrs. Winner’s operates 14 locations throughout Georgia, North Carolina and Tennessee and looks to add 25 to 50 new locations over the next five years. Fishbowl, Inc., has opened the nomination period for its annual “Emerging Brands” report. The report identifies brands that are best positioned for success in the coming year as identified through detailed social media analytics. The brands on this list have been shown to deliver impressive growth numbers over the previous year, with innovative and unique concepts that consumers love. Consumers generally become quickly invested in the growth of these brands in a way that quickly drives brand loyalty and awareness. Restaurant concepts such as Mendocino Farms and Shake Shack have experienced this effect, and have been previously recognized as emerging brands. To participate in nominating an emerging brand, take Fishbowl’s online survey, where you can rate and discuss emerging brand names and restaurant trends, rank factors contributing to your preferences and give opinions on which market segment will be eventually shown to have captured consumers’ hearts in the biggest fashion for 2018. Last year’s full top 30 Emerging Brands list included Sweetgreen, VERTS Mediterranean Grill, and Xi’ian Famous Foods. Two hundred members and guests of Les Amis d’Escoffier Society of New York celebrated three leaders in the hospitality industry at their 81st Annual Fall Dinner held at Chelsea Piers in Manhattan. 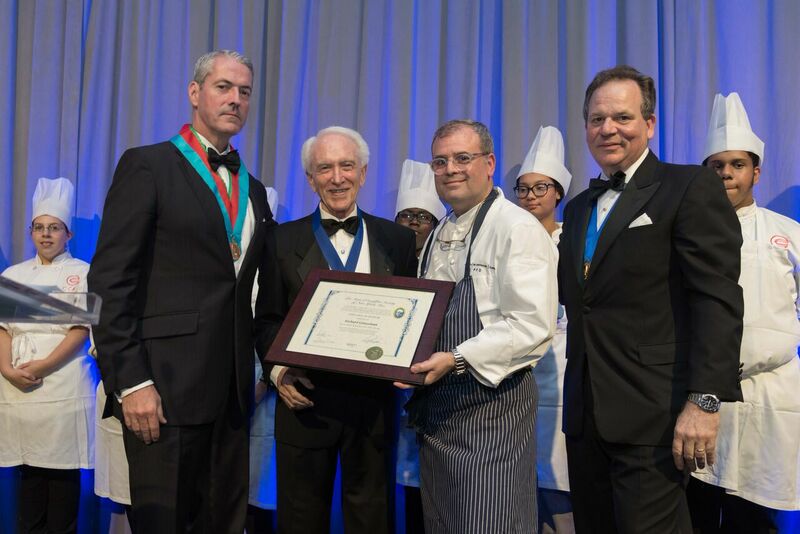 Richard Grausman, founder of the Careers through Culinary Arts Program (C-CAP), was honored as the Industry Leader, culinary luminary Jacques Pépin was named Chef of the Year, and the United Federation of Teachers President Michael Mulgrew was named Man of the Year. Chef Philip DeMaiolo of Abigail Kirsch Catering enlisted his brigade and C-CAP students to prepare a classically-styled Escoffier feast with some modern twists. Wine was critiqued and discussed by noted sommelier Kevin Zraly. Les Amis d’Escoffier Society of New York, Inc. is a non-profit, charitable organization whose mission is to enhance the art of fine dining by supporting culinary education through scholarships to student chefs and to support students pursuing a career in the hospitality industry. The organization is named after Auguste d’Escoffier, a French chef who is credited with simplifying elaborate French cuisine and elevating the position of chefs in society. The society presented $10,000 for student scholarship support to C-CAP President Karen Brosius. Since 2005, the organization has given more than $100,000 to C-CAP. Member Uwe Toedter established the initial Natalie Toedter Scholarship for young women interested in pursuing a career in the hospitality industry, in memory of his daughter Natalie, who passed away unexpectedly of heart failure at the age of 21. “Natalie’s dream was to be in the hospitality industry,” Toedter said. Natalie had completed her first year at Johnson & Wales University and then transferred to Concordia University in Montreal. She died in 2004. The Society hosts fundraising events throughout the year to support The Natalie Toedter/Les Amis d’Escoffier Society of New York Scholarship.